Are you sharing content on different social networks? Do you know the best way to share it for each platform? Sharing your social media content isn’t a one-message-fits-all exercise. In this article I’ll show you how to share content the right way for the top five social media networks. 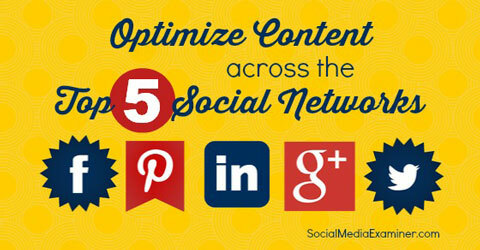 Find out how to optimize content updates for the top 5 social networks. Twitter has always stood apart from other social media networks because of its 140-character limit (which includes spaces and the characters in links and images). It forces marketers to choose their words wisely. A good way to repurpose content for Twitter is to comb through your best summaries or stats. These one-liners work best on Twitter as opposed to any other network you’re using. 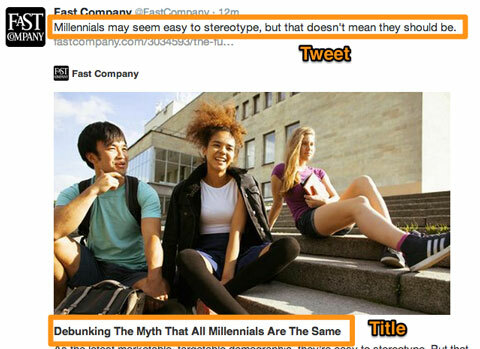 For example, instead of tweeting the title of their article, FastCompany tweeted a summary of it. It’s direct, to the point and tackles a timely subject—Millennials are frequently the topic of marketing conversations. Make Twitter’s 140-character rule work in your favor with succinct summaries. Key takeaway: As you’re choosing and refining the summaries you’ll share, ask yourself this: “Would I click on this tweet?” If the answer is no, keep tweaking. Facebook’s news feed has gone through many design and algorithm changes, but for most users it’s still a good mix of business and pleasure. Since you don’t want to upset that balance (you could lose fans), your marketing messages have to blend in with status updates from friends and family, while encouraging click-throughs. If you’re repurposing your marketing messages for Facebook, use a conversational tone. Your updates will feel less spammy to your fans and fit in better with the rest of the news feed. Keep it conversational on Facebook. Based on their company name and the services they provide, it’s easy to assume thatIBM creates boring or technical content. 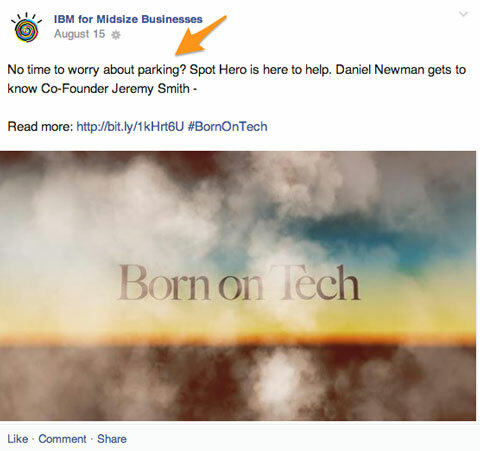 If you check out their Facebook page, however, you’ll see that IBM actually does a good job of making their content accessible and friendly. In the example above, IBM is sharing an article entitled “Born on Tech: Getting to Know @SpotHero.” Instead of opening with that, they gave a short summary that is relatable and conversational. Key takeaway: Make sure the tone of your Facebook message is relaxed and short so it complements other Facebook updates in a user’s news feed. LinkedIn is known as a networking and recruitment site. It’s also a place for industry experts to share content and discuss trends. Keep in mind that as a professional platform, LinkedIn has a different tone than other social channels. Creating discussions around your industry-related content is a best practice. To repurpose content here, make sure it’s relevant to your industry and rewrite it in a way that invites commentary. On LinkedIn, present your content professionally and invite discussion. In the example above, Hewlett-Packard promotes company milestones spanning 75 years of service. But notice they aren’t making the discussion about them. Instead, HP took a high-level view of their topic (advances in tech) and invited their followers to weigh in with their opinions on the bigger picture of future developments across the board. Key takeaway: Create professional marketing messages around your content and pose questions that invite discussion. You’ll help your followers feel like they are part of the conversation. Compared to Facebook and Twitter, Google+ is a relatively new social network. While it may look and feel the same as other platforms, social marketers shouldn’t assume thesame tactics will work here. Given the importance of images on Google+, rework your content to include pictures that tell a story and complement your message. Can your update’s image make a point or tell a story by itself? Of course, you’ll be using text in your update, but try to find an image that can tell a story on its own even if you didn’t have text to back it up. Those are usually the most eye-catching. The Hugo Boss Google+ page makes a point of using this tactic. Instead of only featuring models wearing their clothes, the company tells a story with their images by giving followers a glimpse into the process of creating their products. This sets them apart from other brands. Key takeaway: Add strong pictures to repurposed content so your readers can digest it from a different angle. Consider creating an animated GIF to show your readers how something works. Instagram is all about images and videos—and hashtags. 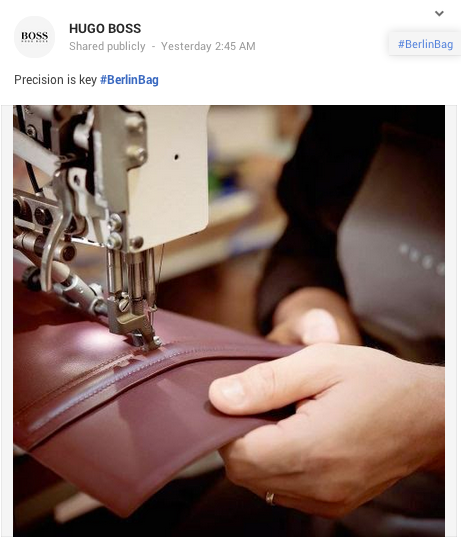 More and more marketers and users are including hashtags in their captions so they can be part of larger conversations. When you repurpose content for Instagram, take advantage of hashtags. They’re an easy way for users to find and share your content. Hashtags expand your overall reach on Instagram. Consider which hashtags you’ll use. You can use existing ones or create your own, or use a combination of both depending on your goals. Asking people to use a customized hashtag in their captions is a good way to gain traction for your content or marketing campaign. TopShop’s Instagram updates use both brand and popular hashtags, making it easier for users who don’t already follow them to find their content. 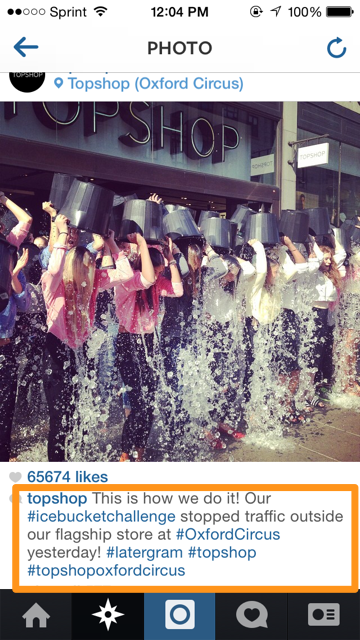 The company always uses the #topshop hashtag and encourages everyone else to include it in their updates as well. The result—crowdsourced content they can repurpose across other platforms. Key takeaway: Use hashtags you think users would naturally associate with your company. Try to incorporate a few that are unique to Instagram (like #latergram in the example above). When you share content across your social channels, don’t just send it out to all the networks as is. You’ll see higher engagement and further reach when you customize your sharing tactics. Each platform has its own tone and focuses on different aspects of sharing. Some social networks value brevity, while others rely more on images. Some of the tactics overlap, but they may be used differently depending on the network.